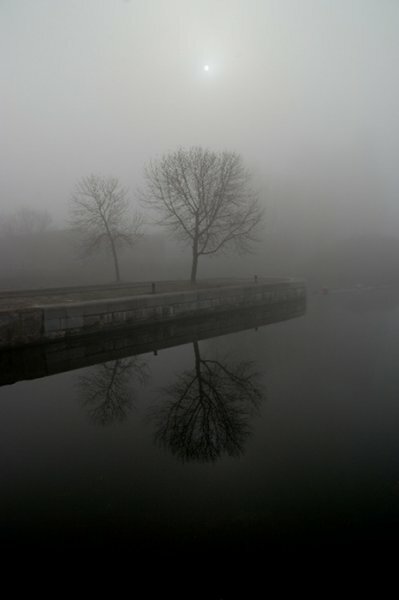 This series of photos, simply titled Foggy Day, shows a side of Montreal rarely seen in daylight: quiet, mysterious, and melancholy. It was a project long in the planning, Jim said. 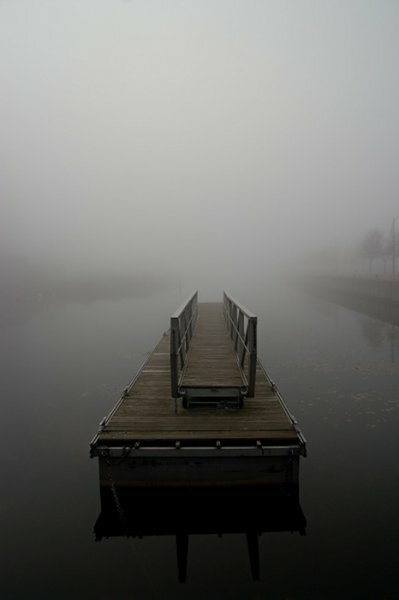 “I was working at a job almost three years ago at the Old Port when one morning a terrifically dense fog rolled in, and the whole neighborhood was transformed into something ethereal and serene. I was floored. The sounds of the city were muted; the landscape became drained of colour. It was like walking through an Orson Welles film. But I didn’t have the camera with me that day. It was terribly frustrating.” Jim then waited patiently for two years for just the right weather conditions to recur in order to take these specific shots. He has made a point of carrying his camera as often as possible. “I promised myself that I’d be prepared for that kind of opportunity again. You can’t take a picture if you don’t have the camera with you,” he said. The photos were taken in November 2008 on the border of Old Montreal and Griffintown. Recently, Jim has begun shooting occasional jobs in a professional capacity. His current job is as an information architect at the digital marketing agency Twist Image. Jim Royal is a Montreal photographer and has been shooting in the city for 15 years. Jim is drawn to architecture and landscapes. He says that the solitary nature of this kind of photography—away from other people and away from the computer screen—has a meditative quality that allows him to relax and reflect. Montreal is one of his favourite subjects, although he has shot in places across North America, Europe, and South Asia.